If Alfa Romeo had a terrible 2012, Lancia is not far from that result, and means also a problem for Fiat Group. Last year this mythical brand was able to sell around 94.000 units all over the world, down 8% circa. 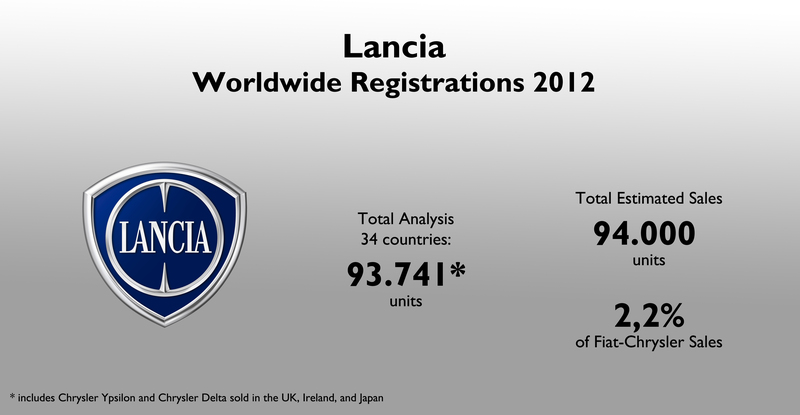 This number includes UK, Ireland and Japan registrations for original Lancia models (Ypsilon and Delta). Once again Lancia fails selling cars as this result is really bad considering its glorious past, and the good status the brand used to have some years ago. There are many problems that explain this bad situation but in my opinion, its range of products and low awareness count for a big part of this mess. Lancia is not well positioned and in many cases consumers don’t even know about it (outside Italy). Besides, it’s hard to determine what Lancia is or what it intends to be. Sure they want to become the fancy option in the segments, but it is my belief that many buyers don’t look for fancy cars when they want a B or C segment car. It could work in upper segments, but not in a Ypsilon with 85 cv and GPL engine (I repeat it works only in Italy where the brand is well-known). But those are personal opinions regarding what I consider Lancia’s main problems. The truth is that Lancia is only popular in Italy where it could rise its market share thanks to the Ypsilon. Hence, it is the brand with lowest export ratio indicator of the group: 24% of its sales took place outside Italy. In other words, if it wasn’t because of the good awareness in Italy, this brand would had already been dead. I was able to get data for 32 markets plus the units coming from Chrysler Ypsilon and Chrysler Delta in the UK, Ireland and Japan. From that quantity of markets (35), 27 are coming from Europe, 3 come from Middle East/Africa, and 2 come from Asia. Europe counts for 99% of the brand’s sales in 2012. But as I said before, sales aren’t balanced in European continent. Italy counts for 77% of European sales, followed by France with 5,6%. A brand can’t survive depending on only one continent/country. That’s why I think the merge with Chrysler is the right thing for the future of the brand. But not all is bad news. 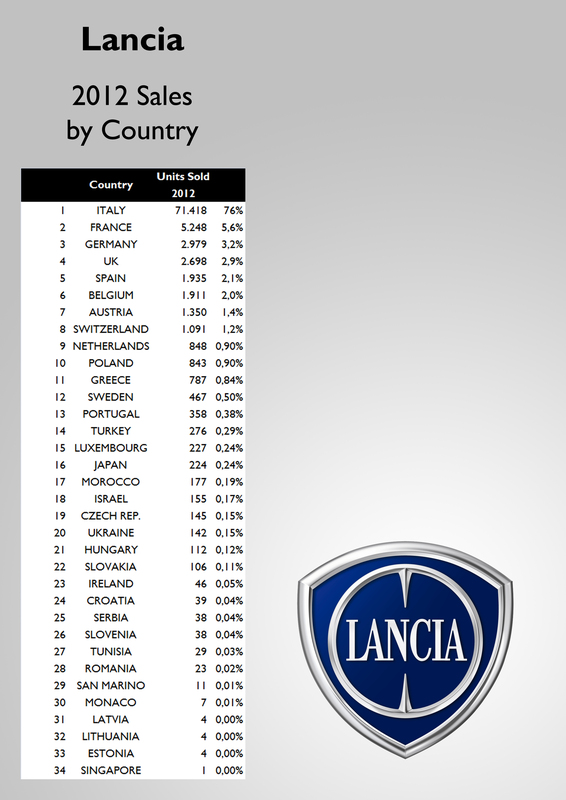 In terms of sales variation, Lancia was the best performer brand of the group in Europe. From 25 countries where I could get information on 2012 and 2011 years, the brand was able to increase its registrations in 20 markets. There is no data to compare UK’s results, but the brand didn’t do bad either. Total registrations fell because of Italian mess, where Lancia sold 71.000 units in 2012 against 86.000 one year before. The excellent results in Western Europe were not enough to offset Italian drop. It was an excellent result in terms of advance, because in terms of volume there is still a lot to do. 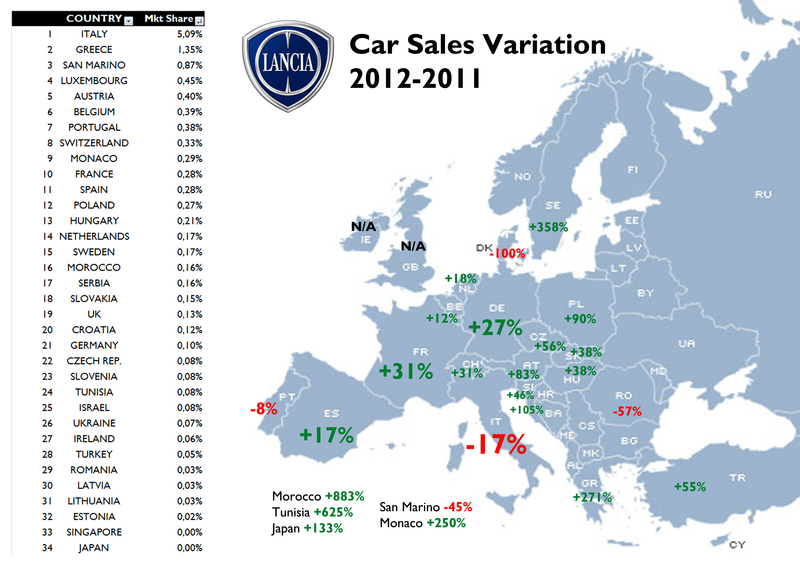 Lancia can barely have more than 1% of market share in only one country, Italy excluded: Greece. But after that small market, the brand is really unpopular everywhere it has an official presence. The future? I’m afraid it’s quite dark, at least in 2013 when no important new products are expected to be introduced. Lancia will have to continue dealing with European crisis with its current range, according to the latest news coming from Alfredo Altavilla, Fiat Group’s EMEA CEO. He said that short and mid-term strategy for the brand will be to develop special editions (such as the latest ‘Elefantino’ edition for the Ypsilon, or the ‘Momo design’). This year Lancia will run out of its best product, the Delta, as its production will be halted along with the Fiat Bravo’s. Meanwhile, the Thema, Voyager and Flavia will continue to achieve low numbers, and the Ypsilon will start its decline period of its life cycle. Lancia may sell around 70.000 units this year. ← Ferrari F12 Berlinetta or Lamborghini Aventador? Juan! In the eruopean map is missing a country! Republic of Kosovo! They also killed the Lancia Musa. Is there is a replace in the pipeline? I think the Fiat 500L is the de facto replacement for the Musa (seeing as it’s the replacement for the Fiat Idea, and the Musa was little more than an Idea wearing a Lancia badge). But one never knows what the Italians are up to, as not long ago a rumour surfaced that perhaps another Lancia model would be coming out of Tychy, Poland (where the current Ypsilon is built), and that this model might be a Musa replacement. I heard about it..but tichy got A segment ..form Serbia can come a Musa remake but i think is coming the next punto before all! Chrysler is going to introduce this year in North Amerca, Chrysler 100..I heard this will be the new Lancia Delta sedan. Nothing confirmed yet, but I believe both, the 100 and new 200 will come to Europe as Lancias. The Chrysler 100 is rumoured to have been axed. I’m afraid not. The Musa was a complete mistake from the point of view of image. In some ways I wonder if killing off Lancia entirely and concentrating on promoting Chrylser globally wouldn’t be a better idea and lest costly. Don’t get me wrong I like many of Lancia’s older models, but with the branding meaning nothing to the majority of car buyers outside Italy it could be a drain in resources that would be better aimed at promoting Chrysler and Alfa Romeo. Would Italian buyers of the Ypsilon purchase non Fiat group product if production ended? I suspect they would buy a 500, 500L or Mito instead, so spending development funds on a revised Mito with 5 door and SUV body options would make more sense to me. Yes man!I think the same..back to europe Dodge and Chrysler! To promote Chrysler would be even more difficult. Lancia’s awareness in Europe is a bit better than Chrysler’s. We’re talking about a European brand (with a very well-known past) against and American one. Europeans buy European. Just look at Lancia Voyager sales against Chrysler Town & Country. Or Fiat Freemont vs. Dodge Journey. Is easir to sell these cars when people already know the brand. However, it doesn’t mean that Lancia’s position is good in Europe. I think thats a fair point but does Europe need Chryslers or Lancias at all? Dropping Lancia as a brand saves money on promotioning a brand that to a modern audience is meaningless. Plus Lancia’s most successful model is the Ypsilon that competes against other Fiat and small Alfa Romeo models, whilst they struggle to find the budget to develop versions of their own small cars; that is madness!!! Chrysler could be used to sell modest numbers of larger American produced products. To keep Lancia going will require investment in smaller cars that would be better spent on Fiat and Alfa, which are the genuinely strong brands. Good point. But remember that the Ypsilon isn’t a direct rival of the Punto/MiTo. The Delta is another option for those looking at a fancy and roomy compact. But yes, maybe the money the spend on it, they could better spend in boosting Alfa’s sales. They had a refresh before changing the brand,and journey have 2.0 mjt,G.Voyager have a 6 automatic and they have now the fiat dealer chain..and we can say something about interiors as well. I think Lancia should die.Chrysler is easier to sell,you can’t sell to a german a Thema will be easier with chrysler. They will have a exotic car,like the 300c few years ago in europe. What gonna be if 500 will have 5 doors?What gonna be for Ypsilon,the first one of the models.. I got lots of ideas for Chrysler europe! No future for Lancia, unfortunately. 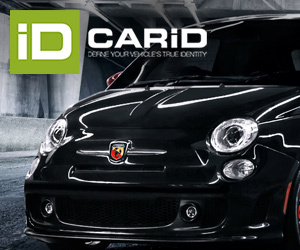 Fiat is focused on Chrysler USA, Fiat brand, Maserati and Alfa. Just no time and resources for Lancia right now. But who knows what happens after 2016. Right now Lancia brand is saved. They will develop new C, D, E segments cars in cooperation with Chrysler plus Voyager plus Ypsilon and this is okay time being. Especially that we can hear about totally new design of new Chrysler cars where Lancia Centro Stile is main power behind. Good luck Lancia ! While head of Volkswagen AG, Piëch was known for his aggressive moves into other markets. He drove the VW and Audi brands upmarket with great success. Piëch also pursued other marques, successfully acquiring Ducati and Lamborghini for Audi and establishing Bugatti Automobiles SAS. His purchase of Rolls-Royce and Bentley was more controversial. After successfully buying the Crewe, England carbuilding operation, VW was denied ownership of the Rolls-Royce name. Piëch later claimed that he only really wanted the Bentley brand. History repeating? Audi rumored to buy Lancia! Just in case you missed Jeremy Clarkson and company on Top Gear suggesting the brand may have been the best ever, we’ll point out a few high points. Instead of peaking as Alfa did from the ‘30s to the ‘60s, Lancias greatness stretches rather firmly into the 70s and 80s as well. A brand known for technology, it was also rich with the same design injection from carrozzeria such as Bertone, Pininfarina and Zagato as was Alfa. In more modern motorsport (and much like Audi itself), Lancia has heritage at both the 24 Hours of Le Mans and on the rally scene… even Group B. Through that racing, it may even be more synonymous with the iconic Martini Racing livery than even Porsche is. Lancia fills a gap in the Volkswagen Group portfolio – slightly redundant with SEAT yes, but steeped in heritage and panache that SEAT seems never having been able to muster. SEAT’s destiny appears to as a regional brand, whereas the regionality seems more a plight of Lancia currently and not indicative of its potential. MQB platform and drivetrains and hand design over to Giugiaro. Imagine a new range Lancia’s Aprilia Shooting brake (Beta HPE), Delta HF Integrale, Fulvia HF Elefantino Rosso, Aurelia 4-porte (Thema), Flaminia Super Sport 4-porte GT coupé and last but not least Stratos HF. Were the Volkswagen Group to sort out the trademark issues, could you just imagine a Lancia Stratos coupe based on the new, smaller MSB mid-engine sportscar chassis, it would be consistent with modern downsizing and would fit with a sub-Audi brand with Italian flare. Imagine a WRC rally car for privateers, a Delta Integrale or Fulvia using components from the Audi TT RS VLN or the shelved Volkswagen Nurburgring programs might be a viable maneuver. I am convinced that the Lancia brand would be such a great fit for Audi. It is rich in design, technology and motorsport heritage. Also, it would bolster the group in the affordable and emotional zone where Audi’s Spanish cousin resides. Mr. Piëch could insist again it is really Lancia VW wanted and not Alfa Romeo. He could expand the Lancia range and increase production from about 70 000 cars a year to 300 000. “I was always looking for one brand,” Piëch could say. If you look at Lancia’s past certainly you’re going to find awesome things. However, Lancia is the brand with the lowest awareness and the weakest position of Fiat Group. No one knows about it, and this is a terrible point compared to Alfa Romeo. Lancia isn’t global. VW buying Lancia is not going to happen. If VW was looking for a brand of that type, it could have bought SAAB for a pittance just a few years ago, but it didn’t. Besides, both SAAB and Lancia are too close to what Audi is supposed to be, and I think VW is looking for a brand (Alfa Romeo) that could be used as a BMW competitor, which wuld allow Audi to be positioned closer to Mercedes Benz territory. You can not say SEAT is a regional brand. It’s biggest market is Germany, not Spain. It is in the top 10 and outsells Fiat even. SEAT is a top ten player in Mexico and its fourth or fifth biggest market is the growing developing market of Algeria. Such succcess in export markets is something Lancia will probably never see I am afraid. what about Lancia been bought by some Chinese brand? To put the final nail in Lancia’s coffin, you mean? Thanks for the stats info and your thoughts. It’s clear that FIAT has fumbled with this brand too long, and Lancia needs to find it’s soul or it will die. I can’t agree with the blending of Chrysler and Lancia, since it’s undermined the heritage and character of both brands. Chrysler had a stronger awareness than Lancia in most of Europe, though it had a poor reputation. But Lancia’s reputation in nordic countries was no better. The current blend of products appeal to few. European car buyers are not warming to American iron rebadged as Lancias, nor are American car enthusiasts willing to buy mislabeled product. Marchionne didn’t give either brand time build on their heritage and strengths, instead tossed both in a blender producing the mess Lancia is today. Fixing the problem is harder now, since the souls of Lancia nor Chrysler are found in Europe anymore. Both brands need to be resurrected to have any hope for either’s success. You have some interesting ideas in your linked article, some similar to mine, others i don’t think are feasible. I agree on the idea that bringing a ‘DS’ type performance image to Lancia will help restore some of it’s lost sporting credentials, but it should be in a way that doesn’t dilute the brand’s heritage. Unfortunately Lancia doesn’t have resources to create new models and is rebadging Chryslers instead. Slapping Chrysler grilles on Lancias is sacrilege, and this strategy will never succeed in bringing new clients, nor restore faith in old Lancia fans. i’ve pondered the same questions for many years, and at one point actually thought the merger might be good. The proof is in the numbers, and it’s not good for Lancia or Chrysler. My guess is that Chrysler will be reintroduced in Europe soon (making it a worldwide brand again) and Lancia will fall aside, or at best retreat exclusively to Italy with rebadged Chryslers. This is why without unique product, Lancia is as good as dead. It will be a very sad day if this happens.